Unlike the majority of Australian assets these coils are designed for our type of off-road, so with stiffness similar to the original but actually longer. This ensures greater driving comfort, hight range. As other our products undergo a heat treatment which allows to obtain specific mechanical characteristics of strength and are subjected to a shot-peening procedure, which increases durability. Special heat treatment: Heat treatment is the most important step in the manufacturing process of a coil spring. The passage in the oven with electronic control eliminates breakages and sagging completely and completely rectifying the piece. Springs made on precision spindles: During the realization each spring is perfectly placed on the spindle and the processing is kept under control by a high technology computer programmed ad hoc to follow the process. Perfect configuration: XT AUTOMOTIVE springs are designed and built to accommodate the exact seat of the original vehicle, adapting perfectly to the fixing points without further modifications. Painting and finishing: The painting powder after application is fixed with a piece firing passage, ensuring an excellent protection against corrosion elements. The smooth surface also reduces any frictional forces. 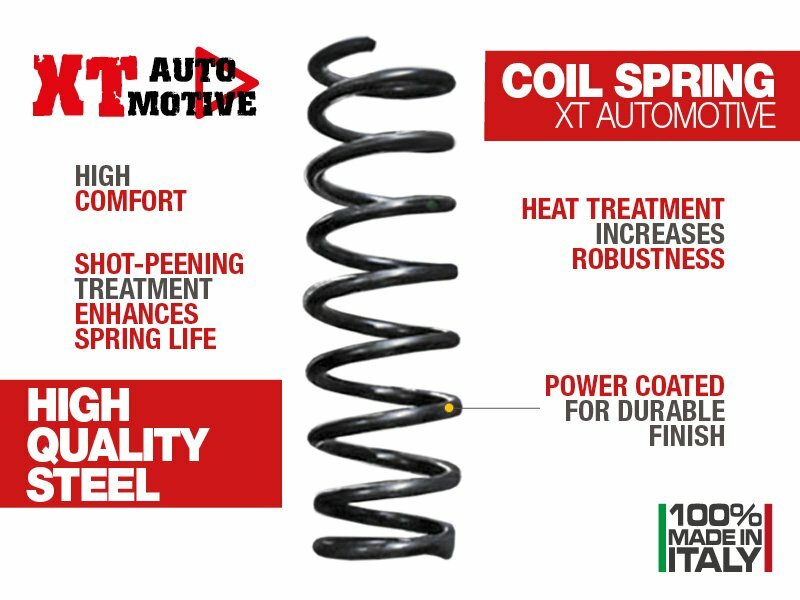 Shot peening: The coil of the XT AUTOMOTIVE springs has a greater resistance thanks to the shot peening which reduces the micro-fractures ensuring a longer life. Perfect performance under load: XT AUTOMOTIVE springs pass the work tests under load and return 100% of the performance even after a long test session. This avoids a subsequent lowering and maintenance over time of the characteristics of response and tightness of the springs.